The Positano sea breeze is blowing and the view of The Sirenusas (also known as Li Galli islands where the mythological sirens were supposed to have lived) from the charming Le Sirenuse Hotel in Italy are breathtaking in the distance. In this moment, you have no desire to be anywhere else, and the picturesque setting permanently imprints itself on your mind for years to come. There’s something about Positano that never leaves you, and fortunately for us, you can now bring a piece of la dolce vita lifestyle home with you from Emporio Le Sirenuse. Carla Sersale’s Emporio Le Sirenuse boutique at Le Sirenuse has gained an international reputation for curated fashion and an exquisite home-ware collection. 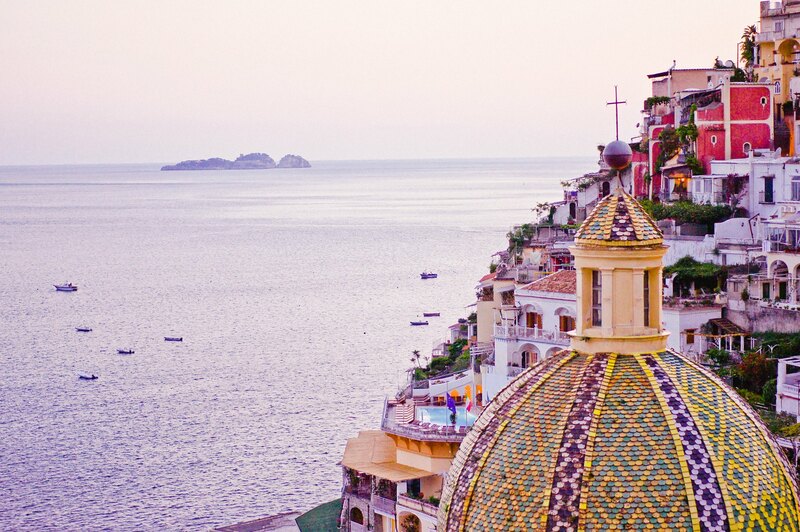 It exudes a sought-after luxury lifestyle of the Amalfi Coast. Carla is the wife of charming Le Sirenuse owner, Antonio Sersale, and her keen eye for Italian style makes the Emporio one of my favorites in the world. Carla describes her latest collection as very light, flowing and feminine. Inspired by the colors of the Mediterranean, it is centered on exclusively printed caftans and hand-embroidered silk dresses; vibrant coral and periwinkle blues stand out in a fresh color palette that evokes sea spray and Mediterranean flowers. “The 70’s were a fabulous time when caftans became the chicest piece of garment for beach parties and yacht wearing. I brought them back to life, in Positano, where they naturally belong: at Le Sirenuse,” says Carla. One of my favorite pieces in the collection is the Anna Tricolor, contemporary, bold colored swimsuit in striking block colors and a deep plunging neckline. I can imagine throwing on a breezy skirt and heading straight to the hotel’s Champagne & Oyster Bar to watch the spectacular Positano sunset. 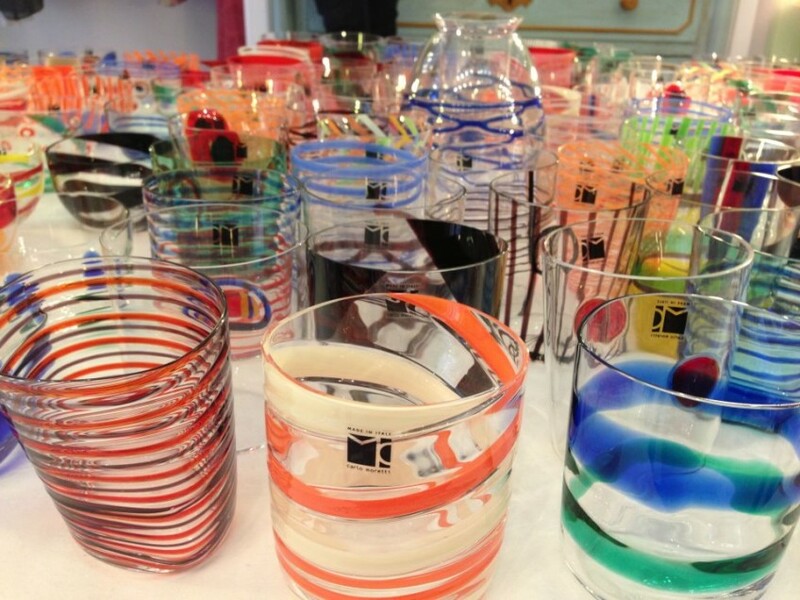 The home-ware collection is simply spectacular including these gorgeous one-of a kind glass tumblers by the famous Venetian designer Carlo Moretti which you can buy at Emporio Le Sirenuse or online. Eye-catching pillow cases and dramatic candelabras also add a touch of Le Sirenuse chic to your home. This summer, Carla will transform the small shop inside the hotel lobby into a display of beautiful porcelain and ceramic objects from all over Italy. She will also be opening a brand new men’s store in Positano. 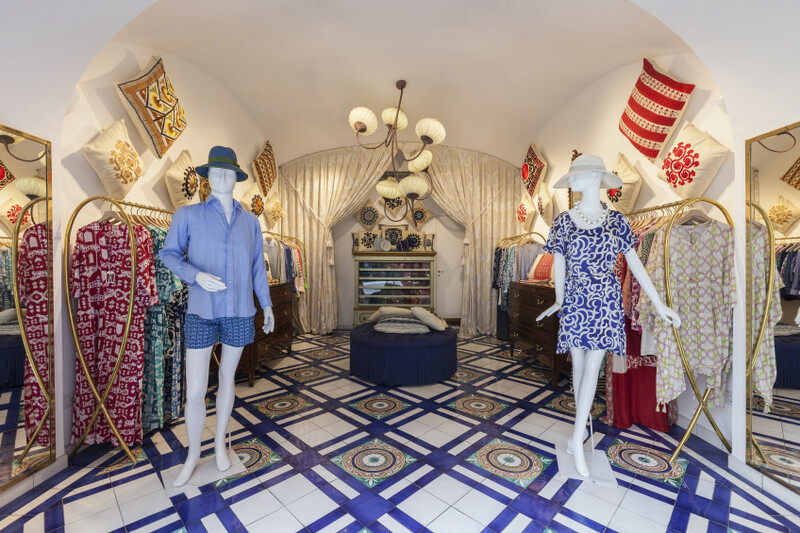 So until you are able to follow the sun to Positano, not only can you shop online, you can now find select Emporio Le Sirenuse women’s wear pieces at Bergdorf Goodman both in-store and online.